I rarely introduce Tag Heuer watches on my blog, it seems like Tag Heuer has a low popularity in our replica watch market, except its Aquaracer series, which has some top quality replicas made before. 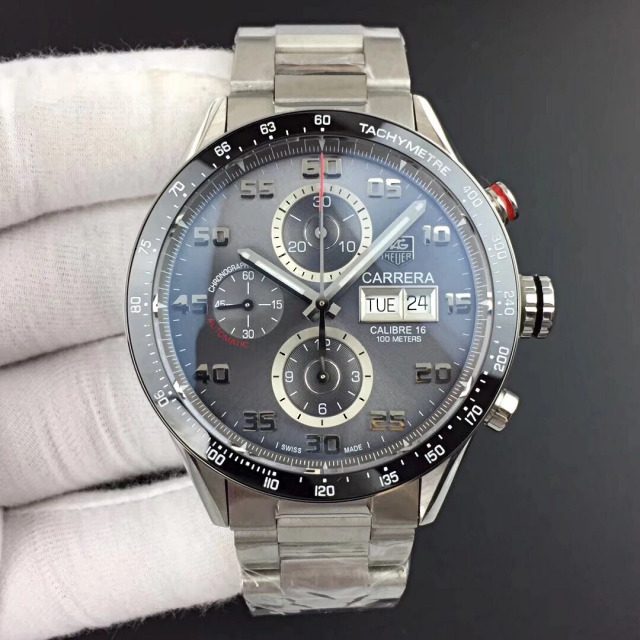 Tag Heuer Carrera is very popular in watch field, especially its chronograph models, which have been famous for years because of high accuracy. 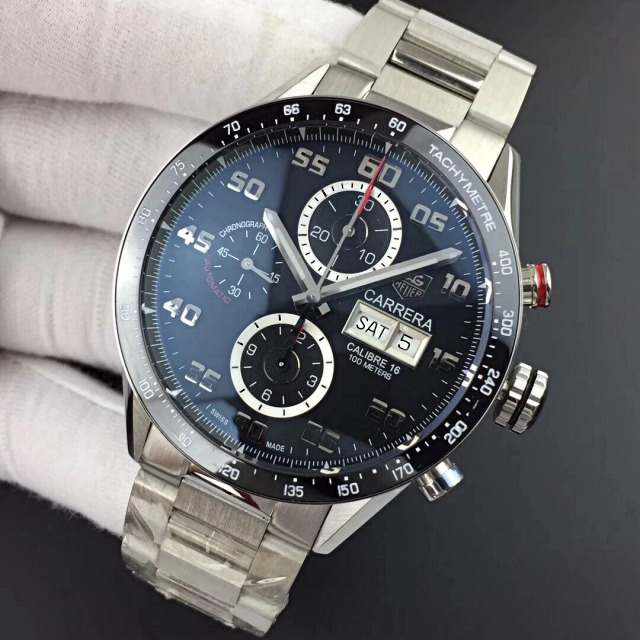 Tag Heuer Carrera is usually made for professionals who have a strict requirement in chronograph accuracy, so, in replicating such a watch, the factory will face great difficulties. 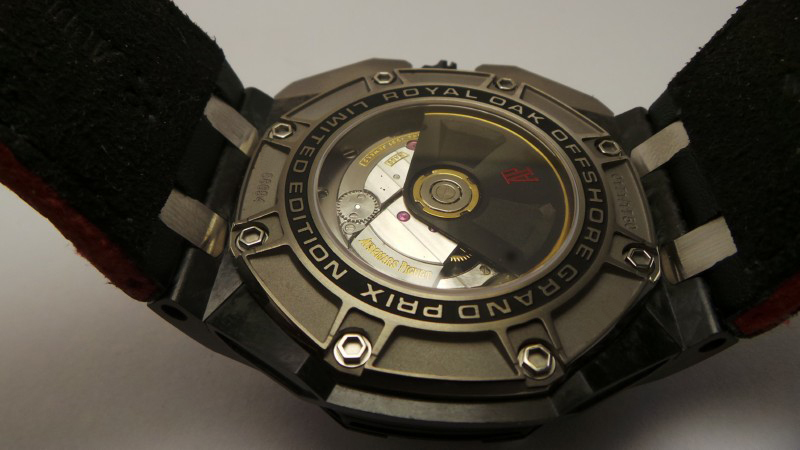 So, one reason I did not give too much reviews on Tag Heuer is that there are no good replicas of them. 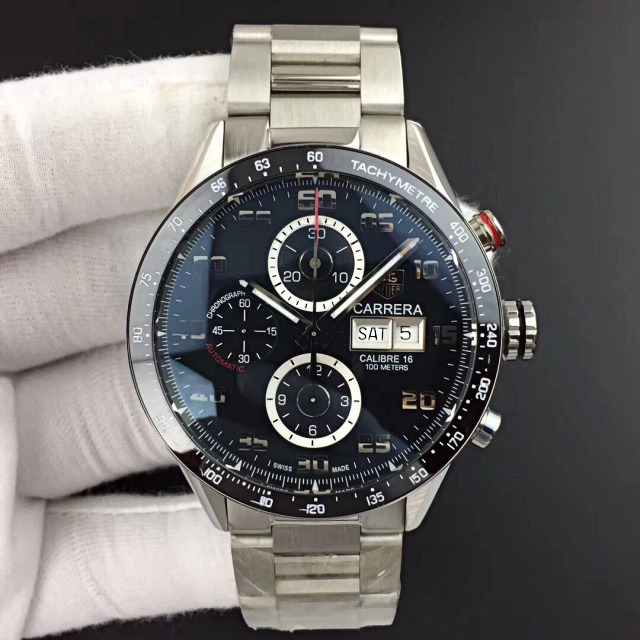 Today, when browsing watch catalog in my computer, I found three Tag Heuer Carrera replica watches that are worthy of being praised, they are good quality replicas in rare Tag Heuer Carrera collection, I shouldn’t have forgotten to share them with your. 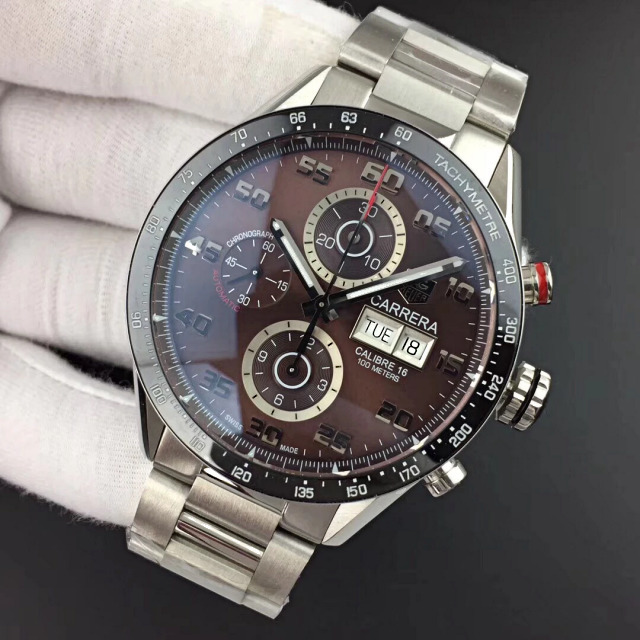 Three watches are made by the same one factory, which is V6, each model has a different dial color, there are black, brown and grey, which one do you prefer? The replica is equipped with an Asia Valjoux 7750 movement, which features a real chronograph function. 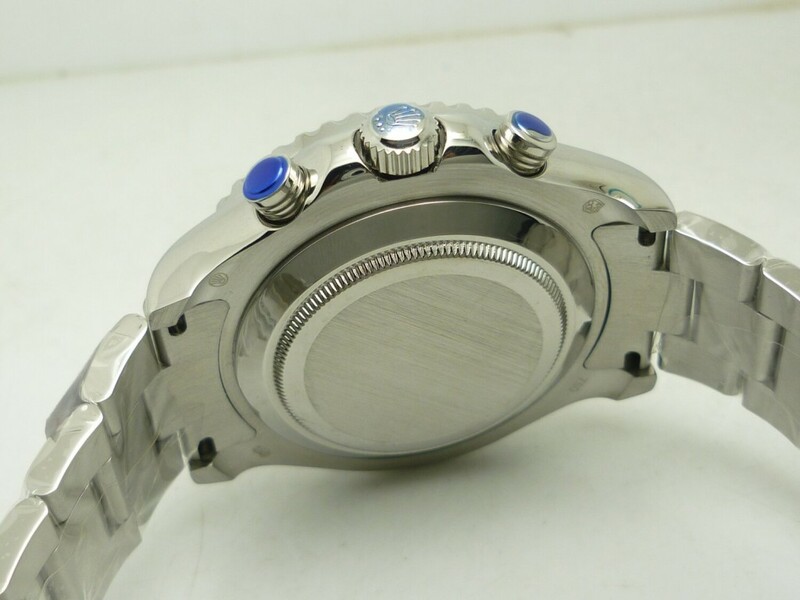 The case back is see-through sapphire crystal, all machine parts are working in front of your eyes. This Asia Valjoux 7750 is the chronograph movement that has been used for more than ten years in replica watch industry, so its accuracy and stability have been tested for that long time. 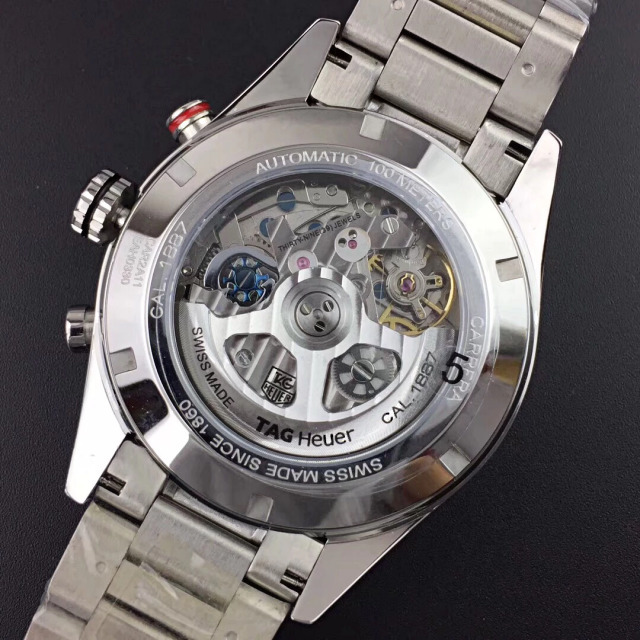 Besides, V6 factory also made decoration on the movement plates and auto rotor of Asia Valjoux 7750 to make it look closer to genuine Tag Heuer Cal. 1887. The replica Tag Heuer Carrera Calibre 1887 has a big case, which is measured to be 43mm in diameter. The case is brushed, lugs have smoothly polished edge and feature an obvious curvature. I like the lugs design of this Tag Heuer Carrera watch, its curvature is more obvious than other brand watches. Black Tachymetre bezel is made of ceramic, the round bezel insert is narrow so the dial looks much larger. The replica watch has functions of hours, minutes, small seconds, day, date and chronograph, you can see these function from its dial, which is in black, brown or grey. A small seconds hand in black is set on subdial at 9 o’clock. The small dial at 12 o’clock is designed for 30-minute chronograph display, while the silver subdial at 6 o’clock is for 12-hour chronograph. When you push the button at 2 o’clock down, the central long second hand with a red tip will start to move, so the chronograph is started by you. In the silver window at 3 o’clock under TAG HEUER Logo, week is displayed on the left, and date is on the right. What flaws you can find on these accurate replicas, maybe you will be obsessed with the thickness of Day-Date font, whatever, I do not care about this. I do not like Tag Heuer watches before, ultil I saw these three Carrera Calibre 1887 models from V6 factory, I changed my mind. 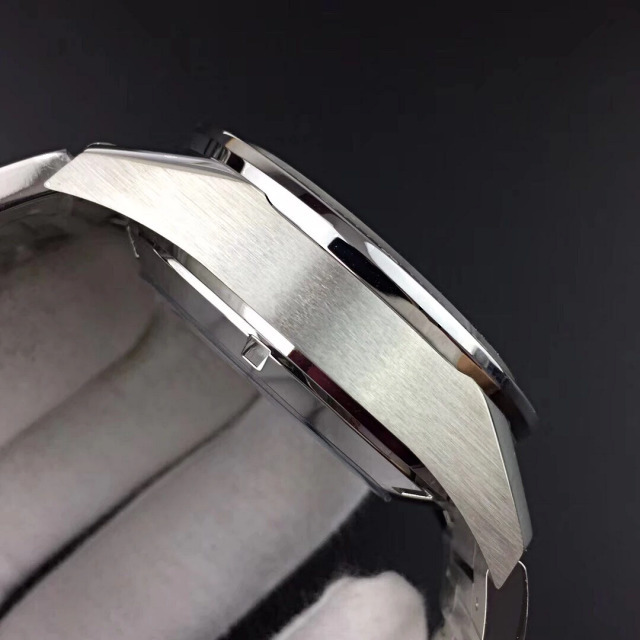 They are really good, however, the watch has a big size and is fully made of solid stainless steel, it feels so heavy but I exactly like this feeling on wrist, please order one and feel its high quality finish by yourself, these photos won’t tell you every thing. 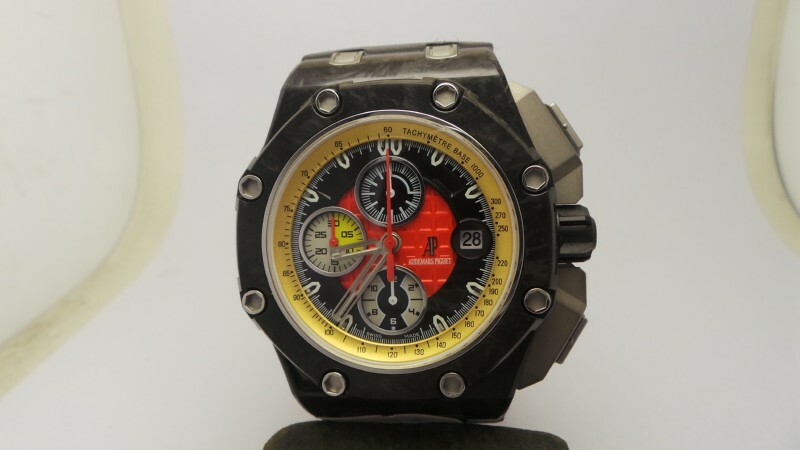 It is a long time not to introduce such a big guy to you watch fans, today, the replica watch going to be reviewed is an Audemars Piguet Grand Prix replica, the highest-level edition of Grand Prix clone watches. The genuine watch is 2010 Grand Prix model Audemars Piguet published. About the replica version, there are a lot of things could be talked about, they are also the advantages that make this replica watch so strong and stable among such a large variety of brand replicas. 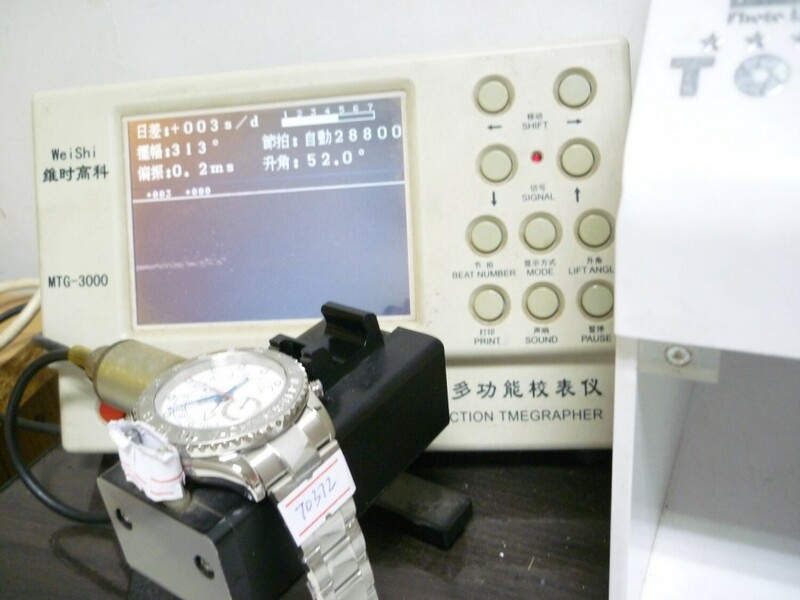 Before, China industry focuses on making the amount of replicas, now they are engaged in how to make the most high-end, accurate and stable replica watches. The case of the Audemars Piguet Royal Oak Offshore Grand Prix replica is full forged carbon, which makes the watch feel lighter than those stainless steel AP replicas, however, forged carbon case also makes the watch mroe scratch resistant. 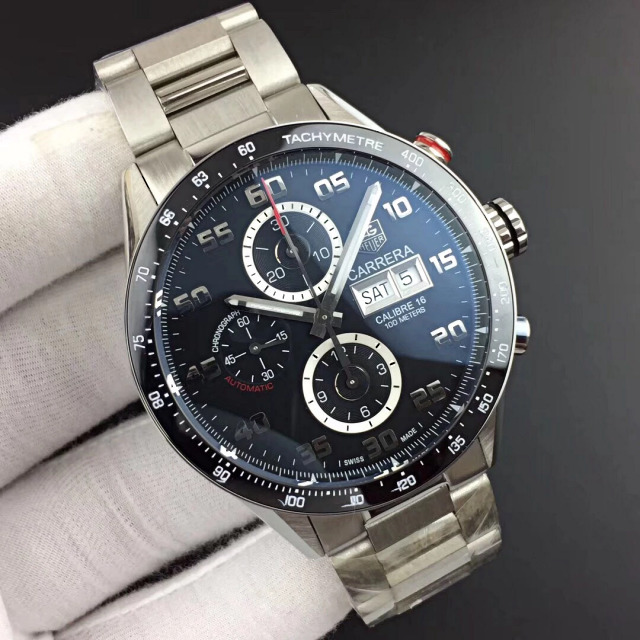 The bezel is also forged carbon made, it has eight octagonal screws to fix the bezel, the case of replica looks larger than other AP replicas because there are two big crown guards protecting the chrono buttons and crown. The replica is made by famous J12 factory, so its case and other metal parts are polished well, in all, the real forged carbon case and bezel are perfectly glossy finished as genuine. 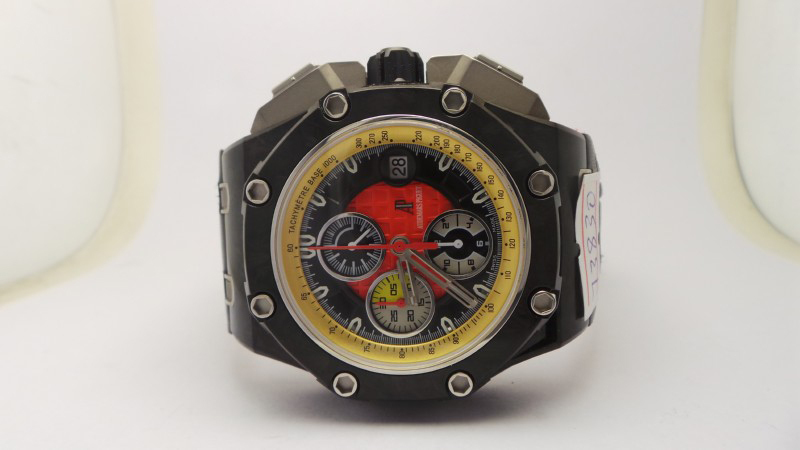 It is also the first AP Grand Prix replica with real forged carbon case. The second big selling point lies in its movement, which is JF 3126, its based movement is Asian Valjoux 7750, and then be decorated to the appearance of AP 3126 caliber. The clone 3126 movement was successfully replicated by J12 factory in 2015, now it has been widely used in these high quality AP replicas. This is one of the most important progress which watch industry has made in recent years. The case back is see-through crystal that features titanium back rim with perfect engravings. 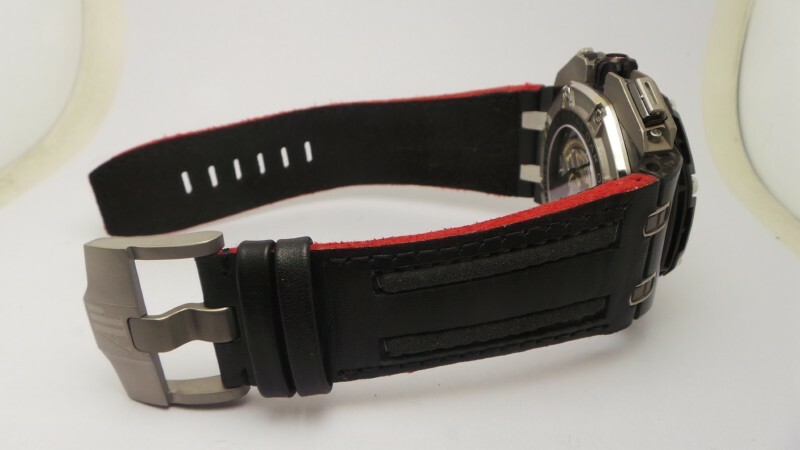 The band is black leather with grey rim, the strap gives you a high-end feeling when being fastened on wrist. The big logo “AP” is perfectly engrave on the clasp, no flaw you can find, every thing goes well and makes such a great beauty. Replica Rolex should be the best-selling replicas on the internet, and Yachtmaster II is welcomed due to its big size and sporty ocean style. Original Rolex Yachtmaster watch is designed for people who love yachting activities, the countdown feature is exclusive and makes the Rolex watch special, it is the most sporty Rolex that inherits the deep sea spirit of Rolex. 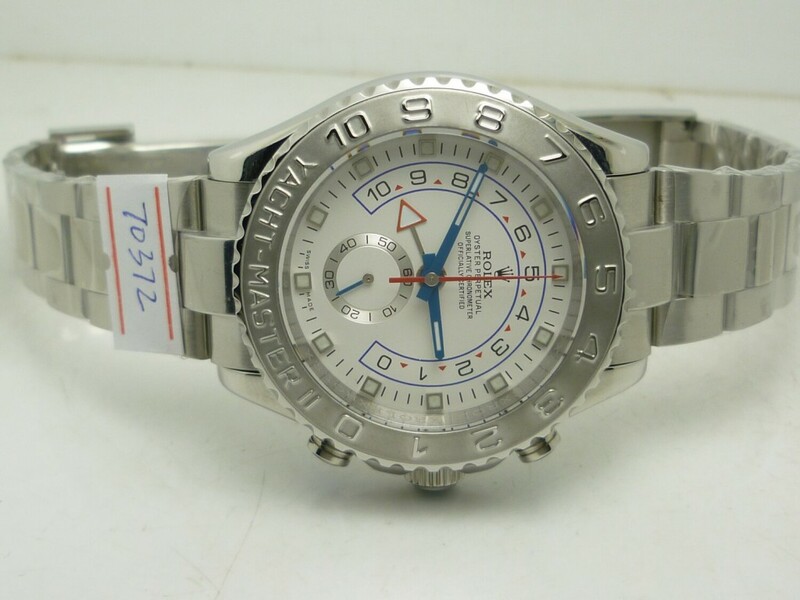 The watch is a replica version of Rolex Yachtmaster II 116688, original watch is made of white gold Platinum, while this replica watch uses 316L stainless steel. Besides the bi-directional rotating bezel, the dial has deep sea blue hands that also mark it a helpful sporty timepiece. 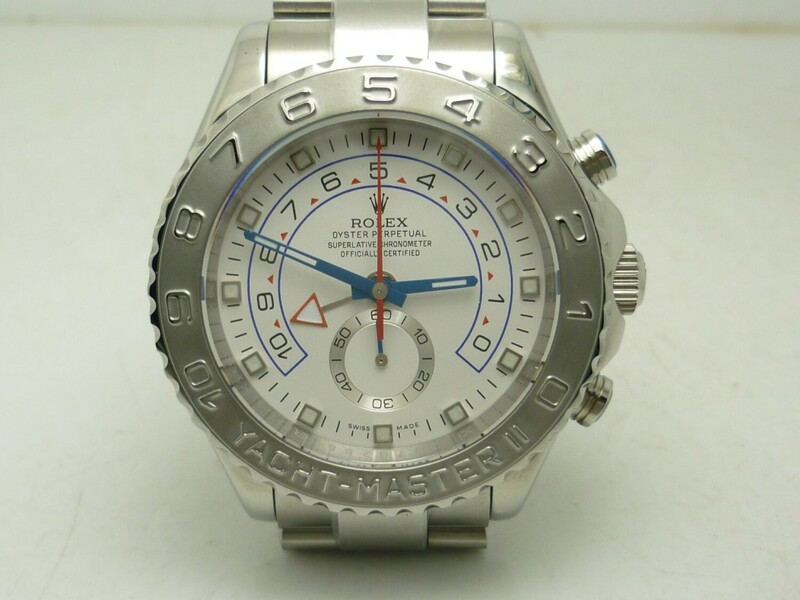 The replica Rolex Yachtmaster II watch features an informative dial that tells you everything about this watch, small second hand is running on the subdial at 6, big seconds chronograph hand is in red color, which is very eye-cathing on the white dial, coutdown dial has deep blue circles and small red triangle marks. The dial features square hour markers that are filled with white luminescence on center, so the watch can emit great green light in dark place, very strong like the genuine. 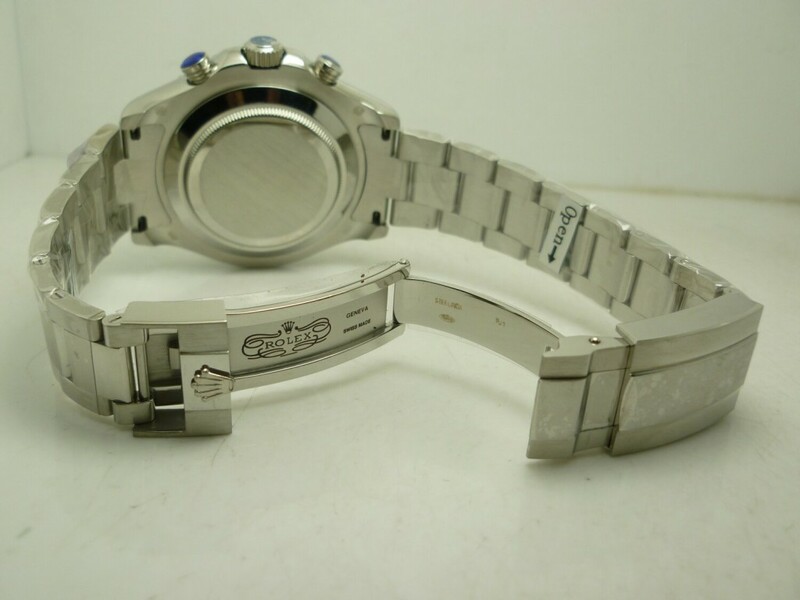 The clasp of Rolex Yachtmaster II replica watch uses the most advanced watchmaking craftmanship, the clasp engraving is clear and has neat lines, the Rolex logo on the buckle also represents the highest engraving level. 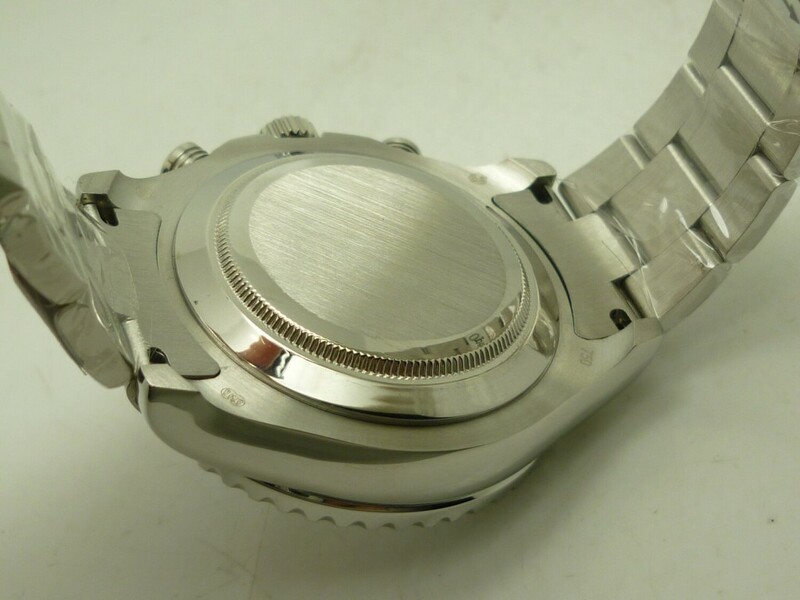 The replica Rolex is equipped with an Asian 7750 movement, actually the auto rotor is decorated to the appearance of gen, see the test result, the movement runs as accurate as genuine, only 3 seconds daily error.